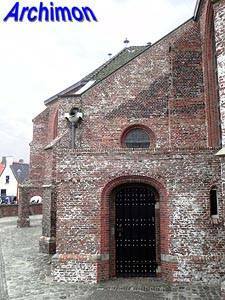 The history of Katwijk aan Zee began in the the late 13th century, with the construction of a chapel. 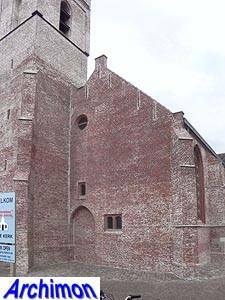 In 1461 the village became a parish and the chapel was replaced by a three-aisled cruciform church with a slim tower, all in Gothic style. 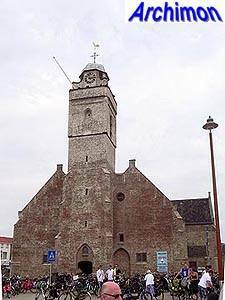 In 1571 protestant pirates looted the church. 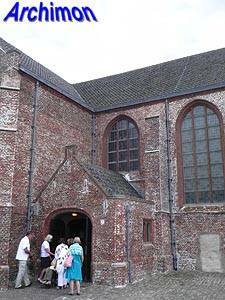 A year later it was set on fire by Spanish troops, destroying the roof and the upper parts of the walls. 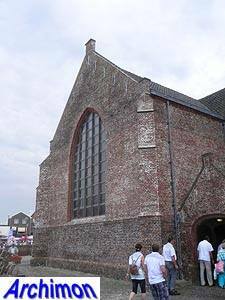 After the Reformation the church was not repaired immediately; instead the protestant community attended the church in Katwijk aande Rijn. 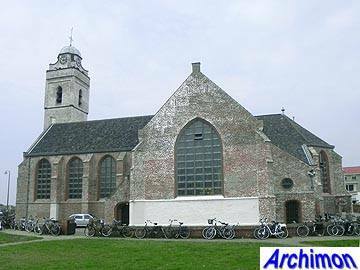 In 1599 it was decided that the two villages would be seperated again. 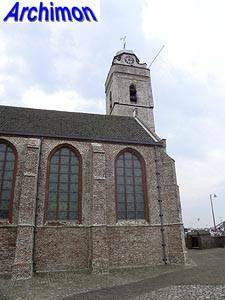 The southern part of the church of Katwijk aan Zee was now rebuiltto serve as a protestant church : half the nave and incorporating the southern side-aisle. 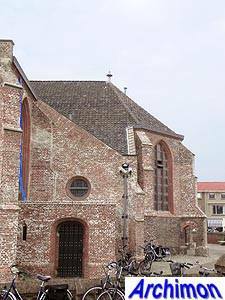 A wall was built right through the original nave and the resulting church was covered with a new saddle roof. 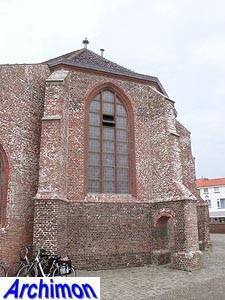 The northern half as well as the transept and the choir remained as ruins for a long time. 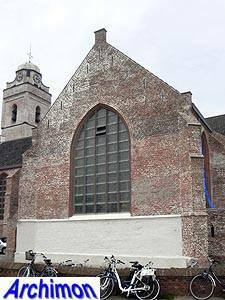 In 1709 the northern half was adapted in a similar fashion and the seperating wall replaced by two pillars, resulting in the current two-aisled configuration. In 1836 a storm destroyed the spire of the tower, which was subsequently replaced by an octagonal dome. 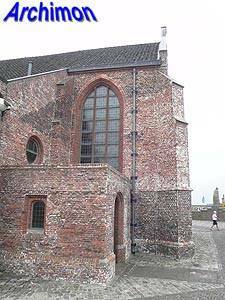 In the centuries since the foundation of the chapel, the sea had taken large portions of the coast and the church, once at the centre of the village, now lie at its very edge, near the beach. Also, it had become too small. 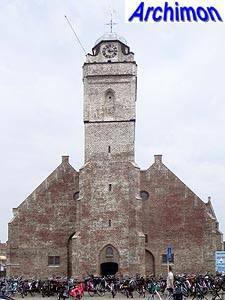 In 1887 a new church was completed elsewhere in the village, and the old church served as a storage house for shipping equipment and salt until 1921. 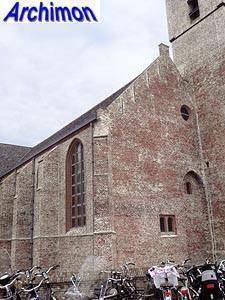 In 1923-1925 the building was restored and enlarged with rebuilt transept, choir and sacristy on the old foundations; the strange proportions indicate that they were now lower than they originally were. 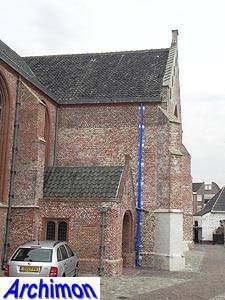 After the restoration the building became a church again, the other church having become too small as well. 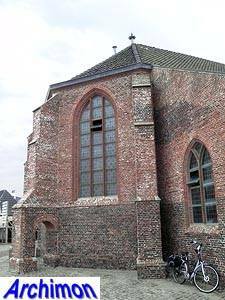 In 1942, during the Second World War, the German army ordered the demolition of the upper half of the tower. 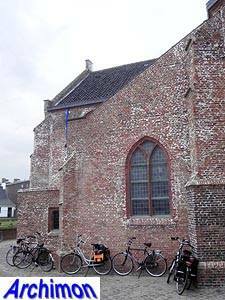 The rest of the church was left alone. 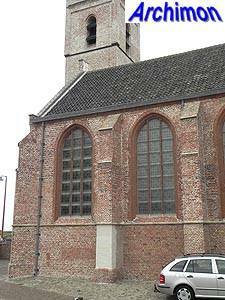 In 1952 the tower was rebuilt, although the original was not copied exactly. 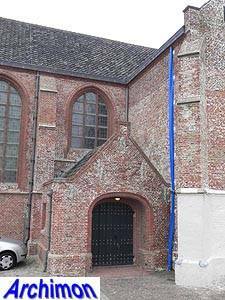 Traditionally, the church is painted white. 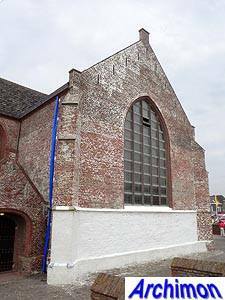 These pictures were made in 2011, when the walls of the church were being restored and the white coat had been removed.